Image from CU Continuing Ed. Many Palmer lab members are highly involved in mentoring and teaching the future generation of scientists. The Palmer lab has hosted multiple undergraduate research students through the Summer Multicultural Access to Research Training (SMART) program. 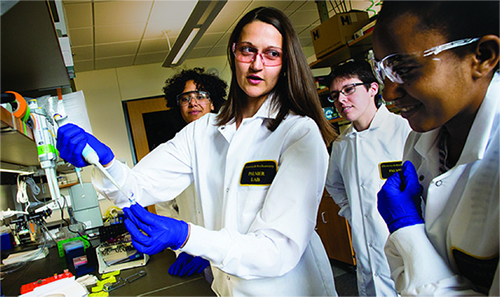 Students in this program work on an independent research project in the lab of their choice for 10 weeks during the summers. SMART students in the Palmer lab spend their summers as full members of the lab, often becoming experts on their projects, microscopy, and data analysis. Although all Palmer lab members are available for guidance, generally one member of the lab is responsible for training and mentoring our SMART student every summer. This opportunity is passed around the lab depending on the interests of the student and availability of our graduate students and postdocs. In addition to working closely with SMART students, Palmer lab members have worked with high school students through the CU Science Discovery program. In 2015, Esther, Ali, Lynn, and Yu hosted 4 high school students in the lab for summer research projects. These students completed four-week research projects involving cell culture, bacterial infections, and fluorescence microscopy. Liz and Eugenia have also taught Teen Café workshops through CU Science Discovery. Eugenia taught about using microscopes to visualize the host/pathogen interface and Liz taught about the potential of bioengineering to develop new technologies. Additionally, in 2015, Sarah and Liz co-taught two CU Science Discovery Biotechnology summer courses. These courses included a heavy lab component, independent projects that encouraged students to think critically about current relevant STEM topics, a visit to a local biotech company, and a career panel. In 2016 and continuing in 2017, Kelsie also taught with the CU Science Discovery summer program. Her summer camps are middle school interactive courses on how science is used to solve crimes. Sarah and Liz also co-taught classes for CU undergraduate students in the spring of 2016. Sarah co-taught Science in the Public Sphere with Dr. Lonni Pearce through the Program for Writing and Rhetoric and Liz guest lectured for a brand new course taught by Dr. Dan Feldheim called Chemistry of Global Health.